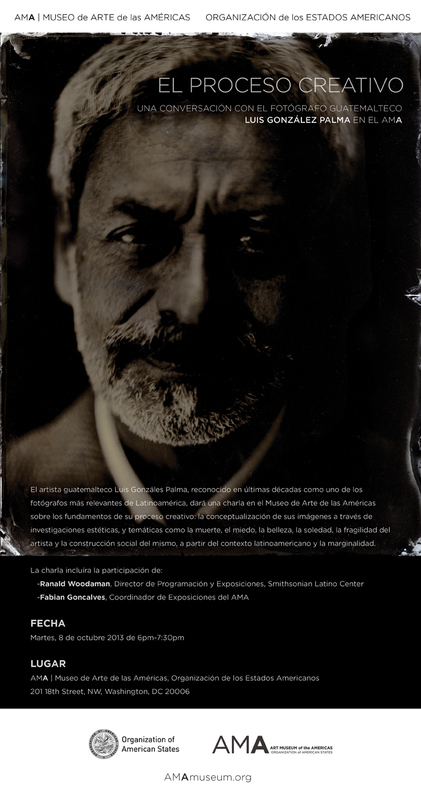 In the spirit of the hemispheric exchange taking place at the forty-third regular session of the OAS General Assembly in Antigua, Guatemala, from June 4 to 6, 2013, the OAS' AMA | Art Museum of the Americas presents this exhibition of artwork from one of the host country's finest artists, Luis González Palma. This exhibition furthers AMA's mission of promoting the Inter-American agenda through the promotion of peace and social change through the arts, while blending the artist's examination of personal and communal empowerment. González Palma examines the power of communication through the gaze and body language. Evaluating the ways in which people communicate calls on the viewer to consider how even the simplest glance can prove vital for the growth of interpersonal relationships and human interaction. The artist conceived of these photographs from the desire that images can contain. These striking images invite the observer to examine the ways in which we react to the world. He has constructed scenarios and images that allow for alternative perceptions of the world and other ways of understanding it.